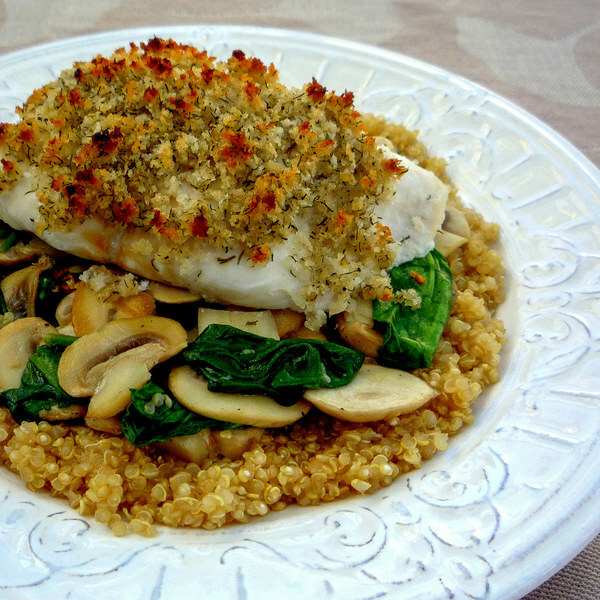 ← Breadcrumb-Crusted Halibut with Mushroom-Spinach Sauté & Quinoa. In a small saucepan, combine quinoa and broth; bring to a boil. Reduce heat to a simmer, cover, and cook for 15 minutes. Remove from heat and let stand, covered, for 5 minutes. In a small bowl, mix together lemon juice, bread crumbs, dill, salt, and pepper. Place halibut in a small baking dish. Drizzle with a little olive oil and top with bread crumb mixture, patting lightly to help it adhere. Place dish in the oven and bake until fish is white and flaky, 10-12 minutes. Change setting to broil and continue baking until bread crumb mixture turns golden brown, 1-2 minutes. Peel and mince garlic. Wash, dry, and thinly slice mushrooms. Coat bottom of skillet with oil. Add garlic and cook until fragrant, 15-30 seconds. Add mushrooms and season with salt and pepper. Stirring occasionally, cook until softened, 4-5 minutes. Wash and dry spinach. Add to mushrooms and toss until just wilted, 1-2 minutes. Uncover quinoa and fluff with a fork. To serve, place quinoa on a plate, add spinach-mushroom sauté, and top with halibut fillet. Enjoy!